From picturesque Lake Zurich to renowned museums and iconic boutiques on the Bahnhofstrasse promenade, the Park Hyatt Zurich offers the very best of this vibrant city right at its doorstep. 138 elegant guest rooms and suites feature marble baths and floor-to-ceiling windows with sweeping views of the city. The hotel offers a host of host of curated culinary events, as well as an award-winning restaurant with a two-story wine library. A full-service spa is a haven of relaxation with extensive array of treatments. 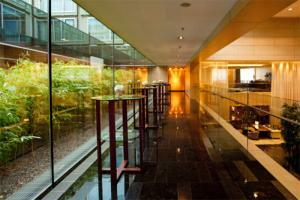 The hotel is approximately 8 miles from Zurich International Airport and 1.5 miles from Zurich Hauptbahnhof. The hotel is a few blocks from the Stockerstrasse tram stop, making it a convenient base from which to explore the city and its surrounds.